Courts will generally enforce noncompete agreements where necessary to protect the interests of the employer. However, courts will generally not enforce noncompetition agreements that are overreaching or where there is no protectable interest at stake—i.e. when the restrictions are unreasonable so there can be no breach of noncompetition agreement. A noncompetition agreement is a restrictive covenant that is often associated with an employment agreement. A noncompetition agreement is frequently incorporated as part of the actual employment agreement. It is a promise by an employee not to engage in certain behavior that might be contrary to the employer’s interests. Under a typical noncompetition agreement, an employee agrees not to enter into or start a similar profession or trade in competition against the employer for a specified timeframe. How can an employee commit breach of noncompetition agreement? The use of noncompetition agreements is premised on the potential for the employee to have the ability to gain a competitive advantage upon termination or resignation. For example, upon termination or resignation, an employee might start his or her own business or work for a competitor. Without a noncompetition agreement, the former employee would have the potential to exploit confidential information, proprietary information, trade secrets and other sensitive information from the former employer. Even though an employee agrees to execute the noncompetition agreement, he or she may decide to breach the agreement once he or she resigns or is terminated. If you are involved in a breach of noncompetition agreement, our Chicago commercial litigation attorneys will represent you and your best interests. 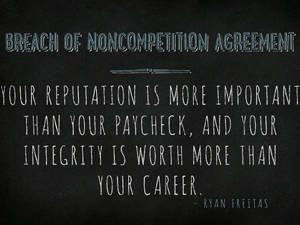 A noncompetition agreements is a promise by an employee not to engage in certain behavior that might be contrary to the employer’s interests, for instance, and employee agrees not to enter into or start a similar profession or trade in competition against the employer for a specified timeframe. In advising our client, our Chicago litigation attorneys will also consider the scope of the noncompetition agreement, the specific facts and circumstances surrounding the employment, and the type of business involved. If you need advice regarding a noncompetition agreement, contact our Chicago litigation attorneys.